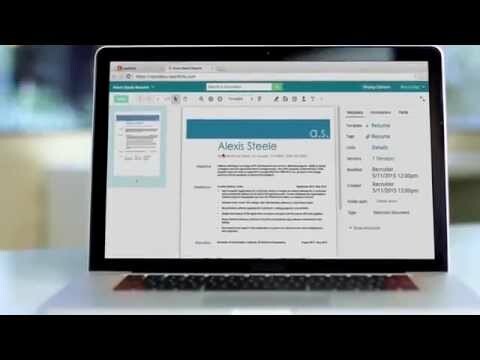 Laserfiche automates processes, manages content and integrates applications across the organization. It works easily within your existing infrastructure by bringing your applications together and simplifying how work gets done. With Laserfiche’s code-free process designer, you can keep things moving quickly between departments—without programming experience. Plus, our document management features digitize and organize business-critical information while ensuring team members are on the same page every step of the way. Organizations can see rapid ROI with Laserfiche’s robust, out-of-the-box features or leverage powerful customization tools to develop solutions that meet their needs. Laserfiche’s award-winning features streamline business operations so you can focus on what really matters—the people and ideas that drive your business forward. We have been using Laserfiche products for approximately 8 years. Our original purpose was to digitize our HR records, and the scanning utilities provided us with just the right solution to get this accomplished with very little stress. Once Laserfiche Forms was released we adopted it and slowly started to push our HR and business processes online. After a year the potential of this product was realized, and we now have approximately 85% of all our HR and Business department related processes online through Laserfiche. Perfect for document retention, long term digital storage, and business process routing. It's fairly easy to use, but at times does require some training. The available applications provide us with almost limitless capabilities when it comes to our business and HR processing. I have yet to find something I am unable to build that has been requested by our district staff. Perfect for document retention, long term digital storage, and business process routing. It's fairly easy to use, but at times does require some training. The available applications provide us with almost limitless capabilities when it comes to our business and HR processing. I have yet to find something I am unable to build that has been requested by our district staff. To be able to fully use the software applications capabilities one would require a fair amount of experience with other applications such as SQL database design, and Windows Domain administration. I would say its not truly possible to utilize Laserfiche to its fullest without personal knowledge of the before mentioned items or a team of individuals that has the knowledge necessary. The end to end process from collection to destroy / retain and that it has the ability to keep the entire process electronic. I like that they are focusing on a cloud solution that makes the application reachable to businesses of all sizes. The continued research and development along with the support make it a product that changes and supports with the times. The cloud needs storage in Canada, ability to apply sequential numbers to documents that would act like a register. You can do this with code and sql tables but it would be great to be able to do it within the form without the requirement of a developer. We've been using Laserfiche since 2006 and have drastically cut down on our lease space because we no longer have the need for filing cabinets. Being able to access client info via our web portal is huge for us. The ability to pull documents where ever we are... in the office, at home or even out of the country. Our clients appreciate us having the information handy in a timely manner. It does also help keep us organized. The ability to pull documents where ever we are... in the office, at home or even out of the country. Our clients appreciate us having the information handy in a timely manner. It does also help keep us organized. There are a lot of features to using it, therefore new staff have a long learning curve. Finding records faster!Laserfiche is the easiest records management system I've ever used. It is quick and easy, it allows to set up your documents in a format to match your filing system. The documents are researchable and can be emailed in a variety of formats. Laserfiche is the easiest records management system I've ever used. It is quick and easy, it allows to set up your documents in a format to match your filing system. The documents are researchable and can be emailed in a variety of formats. The initial set up is kind of pricey. Also, if you (the user) does not put in the information correctly it makes it hard to search those particular documents, but that is training issues on our end. We got Laserfiche 4 or so years ago to help cut down the amount of items we had in our servers at work. With Laserfiche, we were able to have items put into different group types, have metadata associated with each page, set retention periods for how long we have to keep the document, and have access across the whole City. Multiple people in different offices and buildings can add and view files as needed. We also got this product because we can store even more on here with the option of having it saved as a .tif image instead of a .pdf or .jpg that takes up more storage spage. First starting out on the program was definitely a learning curve for everyone. It is not really user friendly, but it does get easier to do. I am currently having a hard time trying to convert my .pdf files into .tif files once they are in the Laserfiche program. I have no issues scanning it in to be a .tif document, but some of my stuff that needs to be added to Laserfiche are already created .pdf files that I do not need to print just to re-scan in. Contact Laserfiche directly for pricing information. The Laserfiche App offers users the ability to complete forms from any location, even without internet access. Every day functionality is streamlined, increasing efficiency. The app is simple to use for both technical and non-technical employees. •	Database lookup: Automatically fill forms with information from databases even without a network connection, ensuring the information is entered instantly and accurately. •	Local forms: Electronic forms can be filled out and saved locally, and forms tasks can be automatically downloaded, enabling users to complete important tasks even when they cannot connect to the internet. •	Improved geotagging: Users can open a location in a map app directly from the geolocation or address field of a form, streamlining the process. •	Import briefcases: Users can download documents and folders as Laserfiche briefcases, and upload briefcases using the app, easily transferring documents between repositories. •	Improved search: Streamed search loads more quickly while still allowing users to search by annotation text, metadata, folder name and more. •	Barcode scanning: The app recognizes and scans barcodes or QR codes, grabbing the value automatically from the mobile device’s camera. Below are some frequently asked questions for Laserfiche. Q. What type of pricing plans does Laserfiche offer? Q. Who are the typical users of Laserfiche? Q. What languages does Laserfiche support? Q. Does Laserfiche support mobile devices? Q. Does Laserfiche offer an API? No, Laserfiche does not have an API available. Q. What other apps does Laserfiche integrate with? Q. What level of support does Laserfiche offer?